upon request in the multi-purpose classroom. We apply a criterion referenced grading scheme where students do different assignments, according to their abilities. The assignments are divided into four categories according to the cognitive domains they address. In addition, we explicitly ask each student to choose their learning goals and therefore the grading rules guide the students to choose the assignments to be completed. This was designed to support both struggling and over performing students by providing a personal learning experience despite our huge teaching groups. The course is taught for extremely large and heterogeneous teaching groups. Illustration 1 presents the diversity of the teaching group. The vertical axis illustrates that where as the computer science students build almost all of their professional skills on top of their ability to program, the students in many other fields just need to understand what programming is. 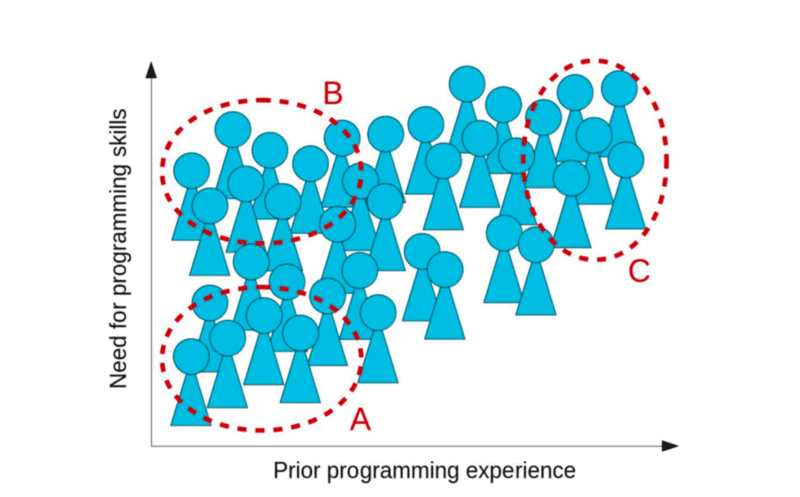 The horizontal axis illustrates that the students' previous programming skills vary greatly: most of the students start with no previous programming knowledge, but the teaching group also includes students who have been programming in high school and their free time. All of these students are attending the same course, and hence our goal is to meet the needs of all these student groups in our pedagogical design.Develop communication and collaboration skills within international teams. ‍Illustration 1: Diversity of the student group. There are 120 programming assignments, which we divided into four categories: category A being the easiest and D being most difficult. The grading rules are a simple table that sets the points requirements for each category for each grade. i.e. for grade 3 you need to collect 500 A points, 800 B points. etc. This approach is not programming course specific but applicable also in other contexts. Illustration 2 presents two simplified figures on how the course can proceed. The time-axis of the illustrations runs horizontally from left to right and there are a number of assignments on different levels each week. In the beginning of the course there are mainly elementary and basic assignments and in the end applied and advanced. Figure 2a illustrates a student who has set a very low target grade and only worked on level A and B assignments. Figure 2b illustrates a student who has had prior programming experience already when starting the course and thus has skipped all the A-level assignments. When comparing these two accomplishments, we can almost say that these two students have taken a different course because their learning paths differ so much from each other despite they are taking the same course. 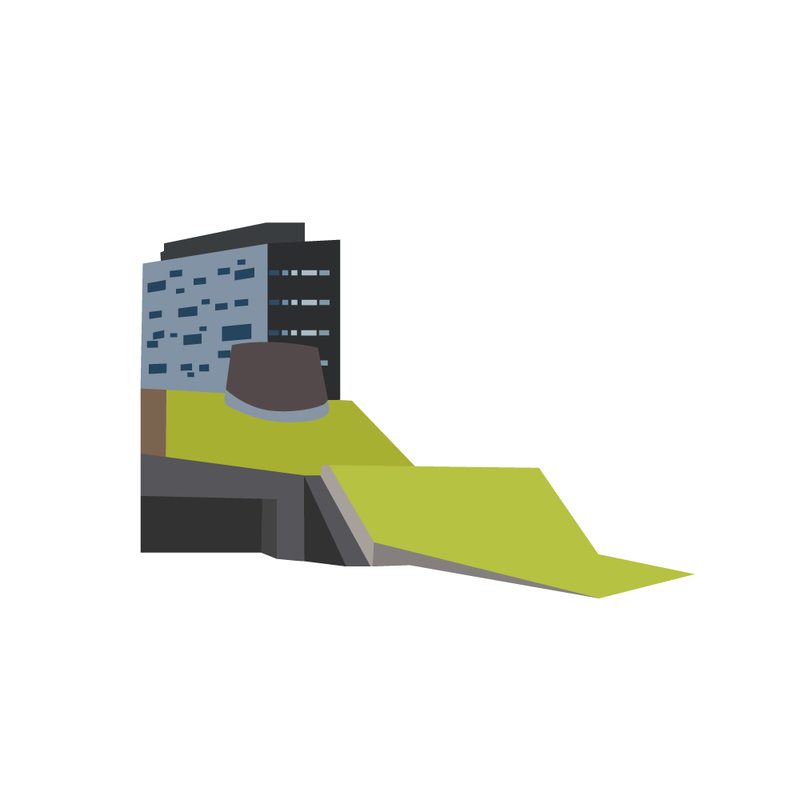 ‍Illustration 2: The differentiation of learning paths in our course setting. There were multiple different kinds of learning paths for completing the course. It was also possible for students to change their target grade in an agile way in the middle of the course. Setting a personal goal is important. Comparing the target grade and the grades they received, we found out that the target grade often defines the upper limit of the performance. This student-centered, agile style of arranging the course that allowed the students to work according to their own schedule was praised by the students who completed the course. The open-ended feedback from students mentioned often, e.g. "It is very effective to be able to work on one's own pace". Of course, there was also negative feedback from students who did not like the approach of working independently but most of the feedback was positive. Approximately 80% of students in each course implementation reported they worked "mostly independently" and over 10% "more often independently than in the multipurpose classroom", when asked for feedback after the course was over. We still need to fine tune our grading system but the basic principle works for supporting students with different needs. For example, the workload of the course needs to be adjusted. Many of the students took more time for this course and completed most the assignments even if they did not manage to do it in the time they were planning to. The teaching assistants reported that many students felt that they need to have grade 5 because they can decide the grade themselves. In the traditional way of grading you typically do your best and hand in your solution for grading. Then the grader decides about your grade. Our way of grading turned this scene in the opposite direction: the students were able to decide their grade themselves by working for a longer time. Psychologically, there is a big difference in getting the grade that the grader decides for you and in making the decision yourself. The aim of the grading was that none of the assignments is so important that missing it would lead to failing the course. This grading system allows the students to compensate missed assignments very liberally. However, compensating is not easy so the students really pay for the free time they have taken in the middle of the course. In addition to observing multiple ways of completing the course, we also observed multiple ways of dropping out from the course. However, we are able to design ways of supporting the students more during the course. It is possible to arrange a personalized learning experience despite the learning group is huge. The key is to arrange everything student-centered instead of being teacher-centered. Flexibility in the course requirements is important for students. Allowing the students to define their goals themselves gained positive feedback from students. In autumn 2016, TUT climbed the renowned QS university ranking for top young universities, now at no. 30. Last year, TUT ranked 48th on the same ‘QS Top 50 Under 50’ list.